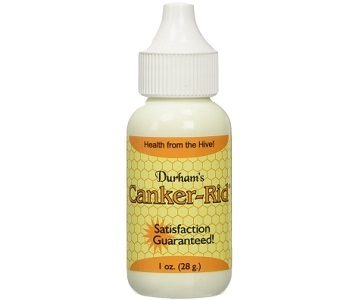 In this review of Durham’s Bee Farm Canker-Rid, we have analyzed factors that contribute to the effectiveness of the product. The information outlined in this review will determine if the product can deliver on manufacturer claims and whether you should purchase it. The manufacturer of Canker-Rid claims that the product is the best remedy for canker sores, mouth sores, and ulcers. The manufacturer does not provide information pertaining to the formula of this product. This is very concerning as it makes it difficult to assess its ability to deliver optimal results. Upon further research, we have found that the product’s main ingredient is Propolis. Propolis is a natural substance produced by bees that works to fight infections and harmful bacteria. This ingredient may prove effective in speeding up the healing process of canker sores, however, there are few clinical studies to support this. Competing products on the market contain formulas of clinically proven ingredients for enhanced benefit. The fact that this product lacks those ingredients, especially Vitamin B12, is worrisome. Vitamin B12 deficiency is argued to play a direct role in the formation of canker sores and should be considered when looking for an ideal remedy. It is also concerning to note that the manufacturer does not claim to follow cGMP guidelines. These guidelines ensure that the manufacturing process is of a high quality and there are alternative brands on the market that hold this certification. The manufacturer does not provide clear instructions on how to use this product nor do they provide values of the included ingredients. These factors are very concerning as they make it difficult to assess both the best use and optimal dosage of the product. We, therefore, cannot determine whether the recommended dosage is too high or low. The manufacturer of this product does not indicate if users may experience negative side effects. The ingredients are argued to be natural and users should not have an unwanted reaction. That said, allergens should be monitored for and we recommend discontinuing use if you experience any discomfort. The product is sold online through the manufacturer’s store. A bottle of this product will cost you $19.95. The manufacturer offers savings on bulk-buy deals, however, these are not substantial. Prolonged use, therefore, may become costly. There is no indication as to how long each bottle will last and, thus, the standard price may prove expensive. The manufacturer offers a 30-day money-back guarantee on the purchases of this product. This suggests that they are confident in its ability to work as intended. That said, the return policy is unclear and the company has the right to refuse a refund. Furthermore, return shipping comes at an additional cost. The refunding of a faulty product may prove too unreliable and time-consuming. There are mixed customer reviews for this product. This suggests that individual reaction varies and that results are entirely subjective. Durham’s Bee Farm Canker-Rid is supported by a lengthy guarantee and the formula may prove beneficial. Howbeit, there are many downsides to this product. The guarantee is unclear, there are several negative customer reviews, and the product lacks clinically proven ingredients found in competing brands on the market. 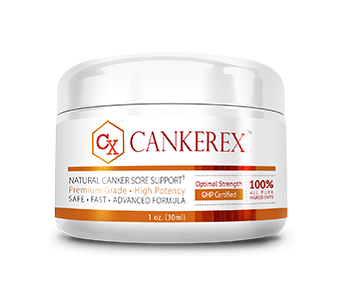 Therefore, we recommend seeking a more proven formula for remedying canker sores.